Story by Rising Tide Conservation, republished with permission. Colurella adriatica isolated from Tampa Bay zooplankton; approximately 45 microns wide and 90 microns long. Photo credit: Eric J. Cassiano. We first spotted Colurella adriatica in one of our larval rearing systems that had been fed wild zooplankton. It exhibited some characteristics that we thought might be advantageous for rearing of small pelagic larvae; such as tangs. After being isolated from the dormant system, a review of photographs revealed a single Colurella in the gut of a first feeding Bartletts’ Anthias. We found this encouraging and began to explore the use of this critter. 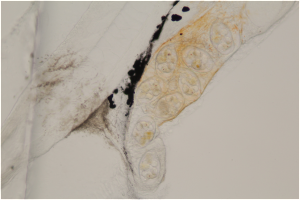 Once identified, a culture of Colurella was established to not only begin examining the culture characteristics but also its efficacy as a live feed. To date, Colurella has been fed to and consumed by Bartletts’ Anthias, yellow tang, Pacific and Atlantic Blue Tangs, Ocellated Dragonet, Leaf Scorpionfish, and Pomacanthid angelfish larvae. Only the Ocellated Dragonet and Pomacanthid angelfish larvae reached metamorphosis, but mortality in the other species can’t yet be attributed to the use of an inappropriate live feed. In a study conducted at TAL comparing light intensity and feeding incidence within Yellow Tang larvae; larvae were provided equal amounts of Colurella and Parvocalanus crassirostris (the copepod previously used in Yellow Tang larval studies at the Oceanic Institute in Hawaii). Of the 480 larvae sampled with food in their gut, all but 7 had only consumed Colurella. Studies examining the culture parameters of Colurella are also being formulated and conducted. From the three salinity trials performed so far, it’s been found that the best population growth occurs at salinities between 15 and 20 g/L. However, a wide range of salinity tolerance has been identified and this species has even been used to feed freshwater fish larvae (eg. Bala Sharks). Although diet has not been tested, they were fed Nannochloropsis algae paste during the salinity trials and multiple cultures are currently being fed three different live microalgaes (Isochrysis galbana, Tetraselmis sp., and Chaetoceros gracilis); indicating a range of possible diets. Current cultures at the Tropical Aquaculture Lab range in size (1 gallon to 50 gallons), salinity (5 to 32 g/L), and diet. 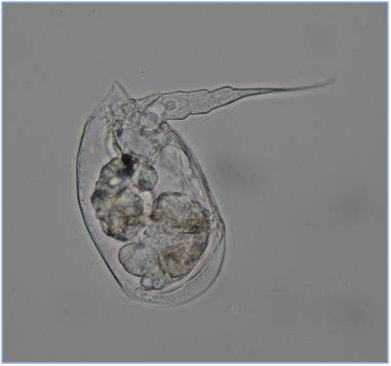 They are also being kept in co-culture with Oithona colcarva; a small estuarine cyclopoid copepod (see post titled “Live Feeds at the Tropical Aquaculture Lab: Oithona colcarva”). Future studies examining the culture parameters and their efficacy as a live feed have been designed and will be conducted in the not too distant future. Additional Reading: For more on the efforts to breed Surgeonfish and Tangs in captivity, see the forthcoming July/August 2013 Issue of CORAL Magazine for an in-depth look by Dr. Wittenrich.